Cotyledon ovata Mill., Gard. Dict., ed. 8. n. 8. 1768. Toelkenia ovata (Mill.) P.V.Heath, Calyx 3(3): 105. 1993. Crassula argentea Thunb., Nova Acta Phys.-Med. Acad. Caes. Leop.-Carol. Nat. Cur. 6: 329, 337. 1778. Crassula articulata Zuccagni, Cent. Observ. Bot. (p. 24) No. 59. 1806; preprinted from J.J.Roemer's Collecteana, see p. 136 (1806-1810). Crassula lucens Gram, Aarsskr. K. Vet.- og Landbohojsk. 1941, 38-43. 1941; cf. DaniaPolyglotta, 1901-44. Pt. 3, 11 (1951). Crassula nitida Schönland, Rec. Albany Mus. 1: 54. 1903. Crassula obliqua Aiton, Hortus Kew. 1: 393. 1789. Crassula portulacea Lam., Encycl. 2: 172. 1786. Cotyledon ovata Haw. (1812) = Cotyledon orbiculata L.
A number of names are in horticultural use, none seems valid and merely refer to cultivars; Crassula ovata var. crispata, Crassula ovata var. gollum, Crassula ovata var. minor, Crassula ovata var. monstruosa, Crassula ovata var. obliqua, Crassula ovata var. obliqua f. variegata, Crassula ovata var. tricolor, Crassula portulacea var. monstruosa. Druce, G.C. 1917. Rep. Bot. Exch. Cl. Brit. Isles 1916: 617. USDA, ARS, Germplasm Resources Information Network. Crassula ovata (Mill.) Druce in the Germplasm Resources Information Network (GRIN), U.S. Department of Agriculture Agricultural Research Service. Accessed on 07-Oct-06. The Plant List 2010. Version 1. Royal Botanic Gardens, Kew and Missouri Botanical Garden. Published on internet. Accessed: 2012 Sep 05. 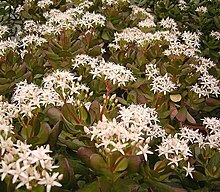 For more multimedia, look at Crassula ovata on Wikimedia Commons.